After I train, this happens every time I’m in the locker room getting ready for a shower. I hear two scrawny, confused dudes (SCD’s) discussing the pro’s and con’s of doing cardio apart of their muscle program. SCD #1: I hate cardio. I don’t do any since I’m trying to bulk up. SCD #2: Me too but you should do at least 20 minutes of HIIT (high intensity interval training) cardio after your weights to keep the fat low. Another cardio debate that is making me lose IQ points by being in the same room as these guys. I will admit, it’s a confusing subject so I’m proving a simple solution today. The reason this issue deserves attention is because I’m frustrated with seeing SCD’s who have great bodybuilding potential lose their waist line, get a double chin and get fatter instead of getting more muscular. It’s a shame to see guys waste away great physiques because of not knowing how to incorporate cardio in conjunction with their weight training routine. Look, it’s easy to bulk up when you’re not doing cardio. But if you want to gain weight while maintaining muscle definition then you need to sweat a little and stop seeing cardio as an enemy. Just like you increase your sets and reps, you can increase the total time like this. If you’re a skinny guy you won’t need to exceed the volume beyond weeks 4 and if you’re in need of losing 30 pounds or more then keep scaling the volume up to 120 and 150 minutes. This is a good one if you can’t afford the time above. Instead of increasing the number of minutes you can increase the average intensity of the same minutes. You may be really comfortable running on the treadmill at 7.0 mph for 20 minutes three times a week but don’t want to run longer or more often than that so you need to start speeding things up. Here is an example below. 1. 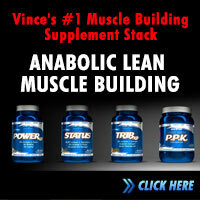 You’ll increase your appetite to consume more nutrients which in turn leads to muscle growth. 2. Better aerobic activity capacity leads to improving adaptations like increased cell “fat burning” capability (mitochondrial density) and vascularity (capillarization). 3. You’ll no longer look like a skinny dude with a pot belly. 4. Improved insulin sensitivity, allowing for more efficient utilization of dietary carbohydrates in restoring glycogen and stimulation of protein synthesis. 5. You’ll be able to handle great volumes with your weights as your work capacity increases. 6. Reduced delayed onset muscle soreness (DOMS). Probably because you’re improving your nutrition delivery system and clearing out metabolic waste. is what cardio protocol are YOU following? As you can see, there is no doubt you need to do SOME KIND of cardio and that’s why I dedicated a complete chapter in my book, No Nonsense Muscle Building, to providing a variety of cardio combinations and progressions to ensure you use cardio to build muscle, not lose it. P.P.S. Post any questions you have about cardio and muscle building below. Well, whenever I finish my workouts I get really really hungry and some people has been telling me that it’s not good to eat right after your workout and that I have to wait about 1 hour or so..Well since you are more experienced can you please advise me on this particular subject. Has anyone else tried jump roping for cardio intervals? I think it is possible to gain muscle and lose weight at the same time. I’ve been doing 3x/week strength training (mainly bodyweight at home) and that alternates with 3x/week cardio. I’ve seen my strength really increase and my muscle definition and muscle size has definitely improved, especially my biceps, abs, back, and legs. My workout partner needs to lose more weight than I do and I have a hard time eating large volumes of food, also I’m vegetarian. I actually have had to add in a small amount of ice cream every day to stop my weight loss which was getting unhealthy when we tried to reduce to a low fat, lower carbo diet. I don’t have time to concentrate too much on changes in eating patterns each day. I eat very healthy, all home cooked with lots of vegetables and protein with every meal and snack. I do make an effort to eat egg white and veggie scramble with low fat cheese with one piece of locally made bread and some fruit 3x/week after the weight workouts (varying the veggies). Other than that I don’t use supplements and try to eat a varied diet. It works for me. My workout partner has a harder time losing weight and is working on controlling portions and choosing healthy snacks and bringing food from home. Currently, reading some muscle building workout over the net. I found different tips and ideas online. 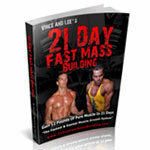 As I have found this page of yours, I really appreciate because I can gain more muscle building topics here as well as I found a muscle building books here. This can help in my muscle building routines. Thanks a lot! thanks for he advice. i ama skinny guy whom actually gained weight over a month period but noticing that i am getting a little bit of a stomach, and i realize that is cause i dont do cardio at all. so of course i am going to start doing cardio. but i have a question…. when doing cardio (and this might sound like a dumb question) should i drink or eat protein before or after or both?? cause i know you said that if you lose the calories then you just eat to get it back but i dont want to eat to much to not get rid of my stomach and then i need to too gain muscle, so i am a little confused on that. Where does the post workout shake fit in? 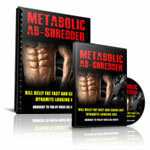 Directly after weight training or after the cardio if you are doing cardio directly after your weight training session? Maybe I am missing it somewhere. What intensity should I be do in weeks 1-2, 3-4, etc? Also during interval training is it 1 minute at high intensity and 1 minute at low intensity after warmup for a total of 10 cycles? Nice video (on cardio). You said the reason you had your drink just after your workout was to burn fat while doing the cardio, yet, reading your book I got the impression that during high-intesity workouts, your body burns energy from muscles and the liver, not from your fat reserves…!? on thuesday,thirsday and sunday i got soccer practice. Is that enough cardio for me? or do i also have to do cardio every time i go to the gym? and do you got a video of good stretching exercises, i heard thats nesserary for building muscle.. Right now, I still can’t really do running cardio. I tried to do some small sprints on my Gazelle for low-impact (due to a herniated disc) and I still get sore around my hip flexors, so I will try and work up to HIT routines. 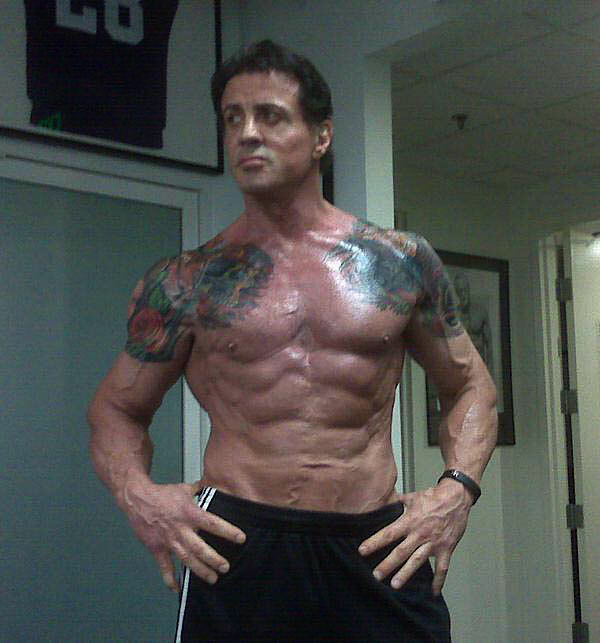 I’m watching Rocky Balboa right now and Sly looks very much the same like back in ‘06. I was just thinking yesterday, about the people who were in their 60s and saying they wished they were young again etc. I had always imagined myself doing daredevil stuff at that age, enjoying life no less than I have so far, and generally keeping healthy…and now I see Sly and that it’s well achievable. With regard to cardio, I do, if I can, 4 days a week of 15-20 min cardio (if not I play some basketball, soccer etc. ), at interval level, and gradually increasing the resistance as I’m getting faster. I’m keeping at least 8 hours between cardio and weights. I do have a big problem with sleep though. I sleep great for about 2 hours after a great weight day. And then I get up and can’t fall asleep until 5am or so, and then wake up at lunchtime. I can’t possibly make it to the gym early any morning. 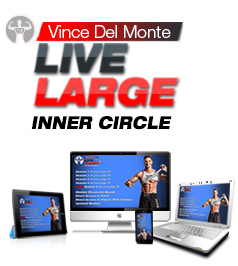 More great guidance Vince … now, everyone … Just GO DO IT!!! Hope your’re having a wonderful day vince :). I have an important question Vince maybe you can answer. I’m familiar with interval training and slow cardio. But my question is what if the workout program I’m doing incorporates a lot of super setting in the muscle building program? Would it be possible to have the cardio be the super sets if I’m doing a lot. I’m using Joel marions high frequency full body workout program right now and at the end of the 45 minute workout (18 sets, 9 of the sets are super sets) I’m always dripping with sweat and my endurance is usually burned out. Looking forward to hearing your idea. I have very toned arms legs & arms, but my belly stills holds the last bit of my fat that keeps me from having my perfect body. I do 2 x 20 interval runs a week (1 minute walk & 1 minute run) and then once a week I do a 6km jog. When is interval cardio the best? Should I be doing more endurance running instead? I have a quick question about cardio. Can sprinting be done instead of just jogging for 3×20 minutes? I’m training for basketball and I don’t want to lose my vertical leap by doing anything too long distance, plus sprinting is a great lower body workout. How would you suggest incorporating sprints into a workout plan? Vince, Can you tell us more about this “carb” shake? Is protein post cardio the wrong shake to put down. I usually cardio on my days off studying martial arts. But i sometimes wonder if it’s too much cardio. Sessions typically last between 1:2 – 2 hours a time. I try to go twice a week but sometimes money is tight. Plus the sessions are different. There is always a 30 minute warmup what consists of jogging around or on the spot, Standing squats, calf raises, press ups and shadow boxing and kicking. Some sessions are more relaxed and spent on forms, patterns and weapons like you see in the traditinal kung fu movies and other sessions are much more intense and include a lot of kickboxing type sparring, bag hitting and more shadow boxing and kicking. I have the typical skinny fat guy sydrome, podge belly with small arms and shoulders. My muscles are very stubborn and i find it hard getting enough calories. Is this cardio too much, not enough, wrong type or about right? @greg – @John – If you do cardio after your workout you are going to be fatigued before you start…also after a proper work out (45-60min) you really need to be consuming your post workout shake/meal etc before your body enter’s a catabolic state. Then even if you have a shake at the gym (which is never as good as real food) and then start your cardio there’s a good chance it will be coming back up again. So it would be logical to perform cardio on seperate days to weights…Please answer this one as it’s doing my head in. 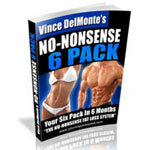 Vince, I am an over the road truck driver and have this pot belly that u speak of. I am 39 turning 40 in sept. 09. I want to sooooo bad to train and eat right on the road, but lack the tools and education needed to suceed. It’s not like I can pop into a gym because we r always driving. Please help!!!! @Pat – @Pat I know about Sly and his HGH. I don’t know too much about HGH effects but I do know that he still looks amazing for 62 and he didn’t build that body on HGH alone. I posted the picture because I thought it was inspiring, that’s all. Good post Vince! This really is some good information on staying leaner while trying to add muscle. I made the mistake of not doing much cardio at all and eating 3500+ calories. Before I knew it I was fat and had a big belly. SO all of you SCD’s out there… make sure to incorporate some cardio or metabolic conditioning workouts in with your program. It pays off, I’m happy to say that I’ve burned most of it off and am now getting really lean at about 11%. Few more weeks and I’ll break into the single-digits. @John – I am on a muscle building workout of 5 days a weeks wherin one day is dedicated for cardio- consisiteing of 5min cycle,then free hands( 2sets od 20 reps of 15 types) foll by 10 min each of elliptical and treadmill then 5 types of abs. @ Chris: 3 days of week of body part training is tiring you out? I doubt it’s the program. I do 30mins CV training 2/3 times weekly on non weight training days. Am I just wasting my time and should I ditch these in favour of this interval training post workout? Is this interval training post weights workout more affective at burning more body fat? @Carl – Carl, the best time to do HIIT is right after your workout. This way you are going to burn more fat. But if you don’t have the time, you could do HIIT on a separate day if needed, but I think the best way to burn fat is to do it right after lifting. Whens the best time to do cardio before or after a workout ? Or on a seperate day all together? @Justin – @Jamie: Yes, that would be the interpretation. @Astro – From what I’ve heard, interval training supposedly triggers the production of growth hormone naturally, so you will get an increase of production compared to regular slow-go cardio. Which leads to the tip I read some place, may have been on another post here or at some other fitness site: Fit in some (5 or 6) intervalls after a workout where you are training bodyparts you wish to improve, this way, they will benefit from an ingrease in GH production. @akshay – If there are several hours in between your cardio and your weight training (as well as a couple of meals) your energy reserves should be filled up again, otherwise it’s not a good idea to do you cardio before your weight training since you will drain your energy reserves. Plus, if you are very fatigued after your cardio, your focus may drift during lifting, which may have a negative effect on your technique/form which may lead to injury. Also, if you do cardio in the morning, your energy reserves are probably near empty due to the long time since your last meal, so you should start burning fat quicker. Just make sure you don’t eat any carbs before your cardio (since you will then burn what you just ingested instead of what you have stored). From what I’ve read, some protein powder can be ok though. @ Astro. Doesn’t sound like you’re very serious and prefer to make excuses. Hi Vince! Thanks for the Post. 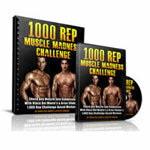 On any weight training day (4 days per week/60mins. per day), no matter what body part I train, I do 20-30min. of low intensity cardio on the cross trainer around (to give my body time to replenish) 15mins. after consuming my post-workout shake (with Dextrose). I find that it helps with recovery and that’s mainly why I do do it. On ‘rest’ days I do slightly more intense cardio and again it’s mainly to help with recovery as the accelerated blood flow seems to assist aching muscles. Is ‘bulking up’ REALLY necessary? It puzzles me how people don’t think twice about piling on an extra 30-40 pounds of FAT (like an off season Pro Bodybuilder???) when they’re actually trying to gain…………………….MUSCLE! It is an interesting video. Is it better to do cardio 4 times a week for a shorter time, or 2 times a week for a longer period of time? If I do 20 min Interval Cardio, and the first 5 minutes is worming up, then how I split the rest 15 minutes. I just want to know that can we do cardio at separate time in a day.like i use to work out in the evening.so what if i do cardio(specially running) in the morning. I use to hit gym 5 days a week,so i have to do cardio haw many days. I was wondering if you could do cardio on a fasting day, Since its a fasting month for muslims. For protocol #1, does 4×15 mean 15 minutes of cardio 4 days a week? Interesting. I have always done my cardio first as kind of a warm up and because I always feel like I have more energy after my cardio. I will have to try to do it at the end. If you do your cardio immediately after your weight training session, when should you consume the “post workout shake”? After cardio or after the weight training session?